Less is more with the Manitowoc Sotto UG-50 gourmet ice machine. 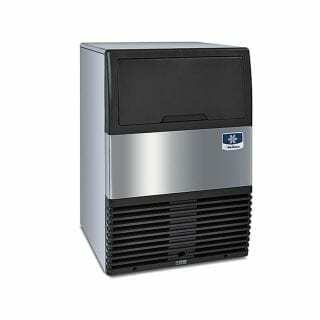 Less noise means that this whisper-quiet ice maker is perfect for front of house operation, perhaps in an in-built niche thanks to its reduced footprint and no top or side clearance necessary. Fewer, larger, uniquely shaped ice cubes per glass mean a more premium presentation, for that wow factor that your customers love to chase. Less time spent cleaning too, what with the tool-free foodzone and the one move, slide-out air filter. The sleek, stainless steel exterior of this machine ensures it’s always on point. This one’s more than a pretty face though, producing up to 43% more ice thanks to a redesigned refrigeration system and a self-adjusting production system ensuring consistent performance no matter the surrounding ambient temperature. Total production comes to 57kg of ice per day; the in-built storage capacity can fit an additional 25kg.